Of all the freshwater fish in Britain, the carp is the most sought after by the majority of anglers. 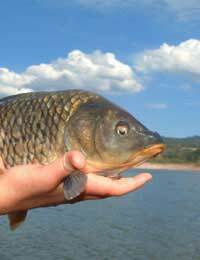 There are variations of the species such as crucian carp mirror carp, leather carp and common carp. They are muscular fish with a large tail and this combination gives carp power and acceleration. Many waters hold fish of 10lbs. or more and carp weighing 20lbs. are not uncommon. Carp live in rivers and still waters. The most popular venues are estate lakes, reservoirs and gravel pits. Carp like to feed beneath overhanging branches of marginal trees or amongst beds of lilies and clumps of reeds or rushes. The characteristic shaking of reed stems or the nudging of lily pads is a sure indication that carp are feeding. Watch out for bubbles rising up and popping on the surface this could mean carp rooting around for food in the soft mud at the bottom of the water. There are anglers who are pure carp fishermen and hunt for nothing else. They travel all over the country and sometimes abroad, searching for that prize specimen. Their tackle and bait is specialised and personalised after years of experience. For the novice carp angler the equipment can be less complicated and less expensive. A general purpose rod of about three metres length is suitable. Use a fixed spool reel with breaking strain line of about 6lbs. If you hook a carp of more than 6lbs. the line will not necessarily snap. The fish is not a dead weight because it is supported by water and is therefore lighter. Floats and split-shot are needed and a good hook size to use is number 6. Don't worry if all this sounds confusing. The people who work in tackle shops are usually anglers and will offer constructive advice when you're selecting equipment. After all, you are potentially a future customer! The natural diet of carp consists of midge, bloodworm, insects, molluscs and quantities of vegetation. They feed at the bottom of the water and will take food from the surface. The traditional bait for all species of freshwater fish is worm. Lobworms, dug from soil or found under stones and redworms, which live in compost heaps, are effective bait for carp. Maggots are cheap, they stay on the hook well and are a good bait. Maggots come in different colours such as red, yellow, white and green. Some days a certain colour works well and other days it is completely ignored, so, it is worthwhile experimenting. Sometimes carp can be spotted feeding on the surface. They often cruise along with backs part way out of the water. In this situation a floated bread crust can tempt a hungry fish. Sweetcorn, part-boiled potatoes and chunks of luncheon meat are all worth a try and if they don't work they might tempt a hungry angler! Always remember that fish are wild creatures and have an instinct to survive. Carp are nervous fish and will be alarmed by movement and vibrations next to the water. Learn to approach slowly and quietly. Blend into the environment. Be patient, be still and watch the carp come swimming to you.